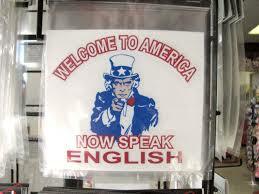 ESL in the 20th Century: Teaching English or Teaching Americanism? This archive has gone through many iterations before settling on what it is now. Originally, I wanted to focus on English education for native speakers and English education for those who are learning English as a second language. As a linguistics student, and also a person who has taken many foreign language classes, the subject of second language acquisition is fascinating to me. However, I realized that, having grown up speaking English, the only interactions I had with English textbooks were with those written for native speakers. I was interested in exploring the experience for those learning English as a second language, seeing what the differences in approaches, tone, and materials were. For a lot of my research, I turned to English textbooks, and tried to see if I could find differences between those written for English as a first language and those written for English as a second language. Due mostly to the availability of sources, I focused items written during the 20th century. The only major differences I found there were 1) that the textbooks for non native speakers seemed to be a lot more patronizing than those for English as a first language and 2) the textbooks for native speakers focused a lot more on composition, punctuation, and grammar, while the textbooks for ESL speakers were focused more on speech and pronunciation. From all of my experiences in foreign language classes, I knew that it was rather common for language textbooks, especially those at lower levels, were quite often slightly condescending, mostly because they have to use simple words and sentence structures while the students are still learning the language. However, one interesting thing that I did notice was that all of the textbooks, in one way or another, touched upon the idea of assimilating the foreigners into American culture. Some of the textbooks were much more overt in their push for Americanism, while in others it was much more subtle, but it was always there. I therefore decided to focus only on the four textbooks that I had found for ESL, and to dig deeper into them and see just how deep the currents of Americanism ran. 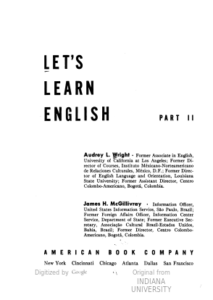 Let’s Learn English Part 2, by Audrey L. Wright, seems on the surface to be just like any other foreign language textbook, with no particular focus on assimilating the foreigners into American culture as quickly as possible. It seems to be offering simply a very detailed overview of the language, complete with lines to mark the relative pitch of each word in the sentence to mark intonation and vocabulary words with their IPA (international phonetic alphabet) pronunciation below them. However, when reading the preface and looking closely at the lessons, you’ll see that the entire textbook “centers around American customs and the everyday life of an American family,” as stated in the preface. There is a fine line between pushing for people to assimilate and simply teaching the culture of Americans, and this textbook seems to dance along that line. 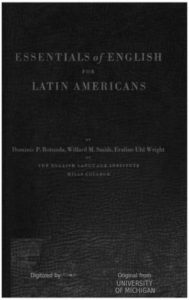 This textbook, Essentials of English for Latin Americans, by Dominic P. Rotunda, begins with an introduction in which it is stated that this book will not explain anything in Spanish, because the author does not want the students to be dependent on their native language, but rather to throw themselves fully into the learning of English. 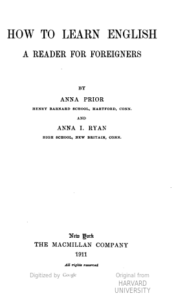 Anna Prior’s How to Learn English clearly states in the preface that one of the goals of English classes is to produce a “desirable citizen.” The textbook is thus structured to not only teach people the English language, but also the American ideals. However, while it does explicitly mention this goal in the preface, those who are using the textbook might not actually notice this overtone if they do not read the preface. 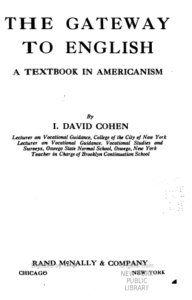 This textbook, written by I. David Cohen, is the most obvious and overt of the four that I found when it comes to the goal of Americanizing foreigners. 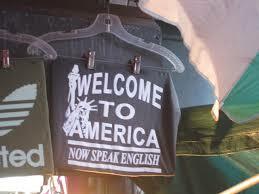 Even the title of the book screams it: The Gateway to English: A Textbook in Americanism. Two inscriptions are found in the book before the actual content begins, both of which talk a lot about how foreigners must be taught to love their country and want to stay in their country – must be taught to be American through and through. The preface also touches on this subject. In the middle of the book there is a page with three declarations: The American’s Creed, The Pledge of Allegiance, and an Oath of Loyalty to the City. All three of these oaths center around being patriotic and proud of America, and to love it and fight for it. Lastly, at the end of the book, there is a whole section written for the teacher on what Americanism is and how to teach it. Amidst all of the overt push for Americanism, this is also, in my opinion, the most patronizing and condescending of the four textbooks I found. ―This archival exhibit was created by Li Breite in Literature and Digital Diversity, fall 2017.